NEW BRITAIN - Josleen Rivera is an unstoppable force right now. Just ask her last two opponents. 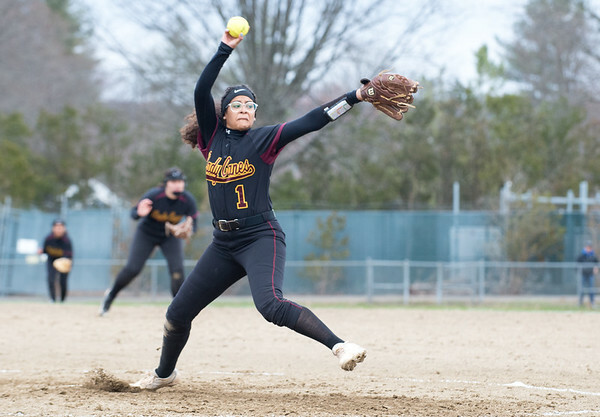 For the second time in as many days, the New Britain softball team’s starter held a team to just one run, as the junior held East Catholic to just two hits on Friday. The one run allowed was crucial for the Hurricanes, who squeezed out a 2-1 win to move to 3-1 on the year thanks to its sizzling starter. Rivera went the distance and struck out eight in the dominant effort. Amanda Jacobs provided the offense for New Britain, smacking a two-RBI single in the third to give Rivera all the run support she would need. Goodwin Tech 26, Prince Tech 11: Unlike New Britain and East Catholic, runs were filling up the scoreboard on Friday in New Britain, as the Gladiators pounded out 18 hits thanks to Bianca Olivo, who went 3-for-4 with 2 RBI. Goodwin Tech pounced early, scoring 11 in the first inning to help mask six errors in the field, as Prince Tech scored 11 runs in the game on just three hits. Jamie Santana went 1-for-3 with a double for the Gladiators, while Soannie Arroyo 2-for-4 with 4 RBI. Plainville 4, New Britain 3: The Hurricanes came into Friday’s match against the Blue Devils shorthanded, and it cost them a potential victory. New Britain was forced to forfeit its third doubles match after the two teams split the remaining six matches to give Plainville a 4-3 win. The Blue Devils were helped by a trio of singles victories by Brandon Zhang, Mike Torres and Travis Levigne. Jose Garcia salvaged a singles win for the Hurricanes, but a doubles win by Kevin Roudini and Dom Polaia sealed the victory for the Blue Devils. New Britain’s duo of Mark Dalmaia and Pedro Gonzalez earned the lone doubles win for the Hurricanes by a score of 6-4, 6-3. Newington 3, Lewis Mills 0: The two-time defending state champs continue to roll, as the Indians swept Lewis Mills to earn a 3-0 victory for the fourth time in the season’s first six matches. The opening and closing sets were close on Friday, but Newington’s veteran poise helped drown out a hostile crowd and remain undefeated. Teddy Fravel led the Indians with 17 kills, while Leonel Caceres served up 34 assists, consistently finding Fravel and Louis Egbuna, who finished with 10 kills in the victory. Posted in New Britain Herald, Goodwin Tech, New Britain, Newington, Plainville on Friday, 12 April 2019 20:34. Updated: Friday, 12 April 2019 20:36.